Location: All events this year will be held at the Powerade Centre in Brampton. 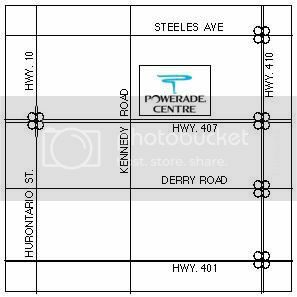 http://www.poweradecentre.com/. For those of you with a keen eye, we only have 7 event dates, but we will be hosting 8 autocrosses this year. In the points championship we will be counting the best 6 of 8 events in the points calculations! The 8 date is still to be determined or, we may turn one of the existing dates into a double header. I will be posting this asap, so look for updates soon! All events start at 10am sharp. Be there at 9:15 am for registration, drivers meeting, and track walk. The most important part is the track walk as this is where you will learn the course!! Exception: The Sunday August 21th event will start at Noon instead, so registration and so on will be at 11:15am! Helmets are Mandatory this year for all participants, and passengers. A Snell 2000 or SA 2000 rating is what we recommend as a minimum! Spectators are always welcome, the only requirement is that everyone MUST register and SIGN a WAIVER! Thank-you, and I look forward to another awesome season with all of you! October 15th is a saturday. Can members/guests still use the club helmets or have they expired? Last edited by E30M42cab; 03-07-2011 at 06:20 PM. Thanks Scott, yes the October event is on SATURDAY October 15th unless otherwise noted. Club helmets are available for rent at $10/day on a first come first serve basis. There are only 12 available in various sizes so there are only 3 or 4 per size. Just an fyi. If you're planning on doing more events then you should check out Rudy's thread about helmets, prices are very reasonable and quality is very good! Last edited by Bullet Ride; 03-08-2011 at 02:18 AM. This is going to be an amazing season for both competitors and spectators, last year saw alot of new competitors, who absolutely fell in love with the sport, and are stepping it up this year with better tires, brakes Ect and will be pushing hard for the points this season. I am really looking forward to both the Compition and comrodery that happens at the events, crazy how much you miss it over the winter months. Steve, no one said anything about a double header? Can't wait to get her out on the course! It feels like forever; been suffering withdraw. Should be an awesome season. Ill try to be on time this year lol. You can come late as long as you bring me breakfast! Awesome. Can't wait till June (gone to Europe in May). Does anyone know if a motorcycle helmet will have the same fit as a motorsport helmet of the same size, from the same mfg? Reason I'm asking is I found a nice SA2010 helmet on ebay, but I want to try on one of that size first before I buy it. I know bike shops carry bike helmets from the same mfg. Sizing from manufacturers varies slightly. Similar to shoes. But the same manufacturer of both bike and auto helmets will be the same as they use the same scale. Hmmm wonder how the subaru will do. I should have coilovers by may depending on the funding situation. I'd be more worried about buying good tires and brakes if your worried about doing well.